These x-ray images tell a very important tale about aging that every person should know. 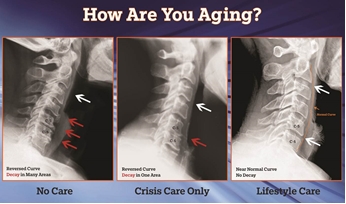 Crisis Care Only: The middle x-ray represents a patient who has had Crisis Care only. At times of injury or pain this person would mask the symptoms with medication and only go to a chiropractor to get relief from their condition that the adjustment or other modality would provide. The areas of decay are confined primarily to two segments, C-5 - C6. This person responded so quickly to his Crisis Care adjustments that he never followed through on correcting the underlying structure. This has allowed this patient's spine and nervous system to deteriorate more comfortably over the years. The deterioration is limiting their function and can be affecting his health on organic levels even while no symptoms are present. We've known as early as the early 1900s through the Windsor Autopsy Study that spinal nerve deterioration can cause organic disease and dysfunction. We now know that the impact can be even more significant as it can affect the brain. Research has shown that 90% of the stimulation to the brain comes from movement of the spine. A healthy spine and nervous system is vital to healthy aging on every level. We are getting the advanced notice that our parents and grandparents never received that, whether we like it or not, we will probably live longer than we ever thought. Let's learn from our grandparents' generation and make the health of our spine and nervous system, chiropractic Lifestyle Care, a priority during every stage of life and not just wait for a crisis.